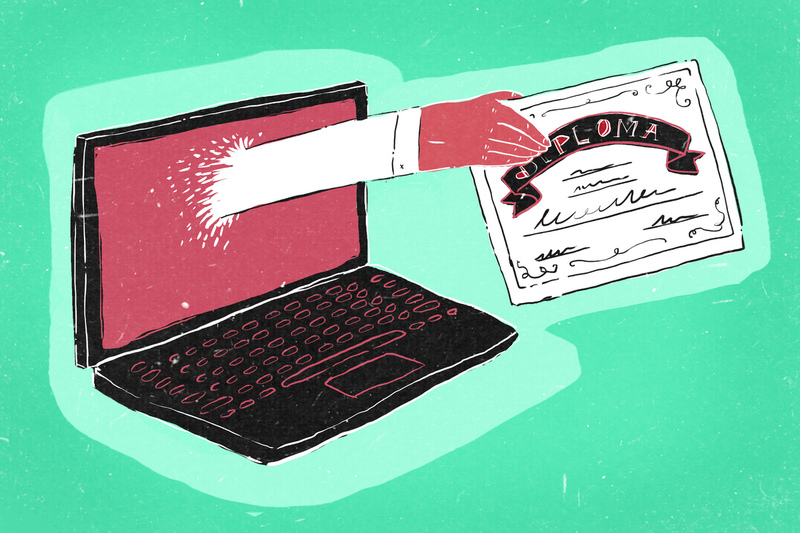 The Online College That's Helping Undocumented Students : NPR Ed There are no federal laws in this country that prohibit undocumented students from enrolling in college. But few of the students can afford it. Now, one online college is offering them an option. Federal law does not prohibit undocumented students from enrolling in college, but it does something nearly as effective, banning them from receiving government aid. In recent years, though, some undocumented students have stumbled upon a little-known, nonprofit online university that doesn't charge tuition and doesn't care about students' legal status. University of the People certainly got the attention of Miguel Angel Cruz. The 27-year-old entered the U.S. illegally from Mexico a decade ago. He settled near Tampa, Fla., where he now shares a small trailer with his father. Cruz learned English and earned his GED. But his dream of going to college was just that — a dream — because of the high cost. Then, he started searching online. "I was Googling, not for free but for cheaper universities, and I found the University of the People," Cruz says. He had never heard of the school but had nothing to lose, except the $50 nonrefundable admission fee he paid to enroll in the school's business administration course. A similar course at the University of South Florida, near his home, would have cost close to $1,100. Cruz is precisely the kind of student Shai Reshef says he set out to help when he founded University of the People six years ago. "We have students from 170 countries," Reshef says. "We have refugees, survivors of the earthquake in Haiti, the genocide in Rwanda. But about a quarter of our U.S. students are undocumented." Reshef, an Israeli-born entrepreneur, made millions from several for-profit, online education ventures in the U.S., Europe and the Middle East. He says the idea for creating a tuition-free online university came to him after spending time in several underdeveloped countries where most people have little or no access to higher education. Today, University of the People has 2,500 students enrolled. Half are in the U.S. But what exactly are these students getting? Is this online school a realistic option for students facing so many hardships, poverty, and, in the case of undocumented students, deportation? And what about the quality of the school's courses and instructors? Those are some of the questions that the Distance Education Accrediting Commission looked into during its three-year review of University of the People. In 2014, DEAC gave the school its "stamp of approval." The school has vowed to remain tuition-free, but students do pay $100 for every end-of-course exam — to help support its $1 million budget. "A four-year bachelor's degree will cost $4,000 in total," Reshef says. "For those who don't have the money, we offer scholarships." Reshef says a quarter of the school's students don't pay anything at all, thanks to those scholarships, which are funded by companies including Hewlett-Packard, Microsoft and Intel. The school's academic credibility has also gotten a huge boost from partnerships forged with New York University; University of California, Berkeley; Yale; and Oxford. Education experts have praised University of the People's surprisingly high retention rate of 75 percent, but what Jamie Merisotis of the Lumina Foundation says he likes most is that the school was built precisely to serve poor students living in difficult circumstances. Merisotis, author of the book America Needs Talent, says many of the undocumented immigrants living in the U.S. are young and talented but have no access to a higher education. "Postsecondary education is the key to integrating them into our society and taking them out of the shadows," Merisotis says. "Even if you kick them out of the country," Reshef says, with a good education "they will be much more desired wherever they go. So it's a win-win situation for everyone." As for Miguel Angel Cruz, he says he's on track to earn a bachelor's degree in business administration in another year or two. But he's not waiting to put what he's learned into practice. He's now the manager of the tiny trailer park where he lives.